Get ready to march to the polls—October 22 at 5:30 p.m.
What’s a march without a marching band? Come celebrate the first day of early voting—and show fellow voters how fun voting can be when you bring friends! 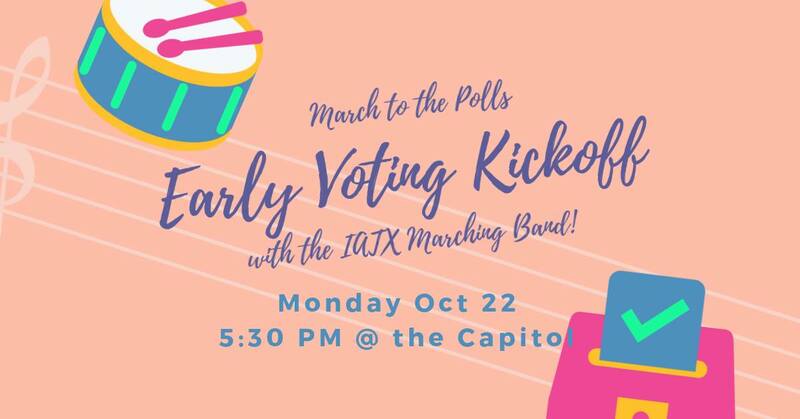 We’ve recruited an Indivisible Austin Marching Band for this, and it should be a grand time: we’ll kick things off with some tunes at the Capitol, before marching over to the nearest polling location at the Travis County Granger Building. We’ll convene near the Capitol south steps at 5:30 PM, rain or shine. If you’re interested in joining the band, please reach out to Cindy Sadler (cindy@cindysadler.com) with your name, instrument, and email address. Can you help take photos or video? Please message Indivisible Austin directly or via this event. We’re not done after Monday: throughout early voting, we’re looking for folks to lead and participate in local “marches” to the polls (maybe even with your own music?). Sign up to lead a parade, a marching band, mariachis, or just a group of fine folks doing their civic duty in the 2018 midterm elections! And remember, even if you can’t join our Kickoff March or host your own, make a voting plan & #BeATexasVoter—and help everyone you know do the same.